Architectures are typically not built from scratch, but rather architects make use of existing models as a foundation upon which new architectures are constructed. These models underpin the new architectures and create a consistency and foundation for any type of architecture regardless of the domain or level, from Strategic, Segment or Solutions architectures. There are a number of published Technical Reference Models (TRMs) available, and while it would be judicious for an enterprise to adopt one of these it might be necessary to adapt the selected TRM to suit an enterprise's domain and level of maturity. The structure and the content of the TRM can often be derived from existing platforms and services, but will typically have to be augmented at various times to meet the demands of new or emerging architectural needs such as new services and interfaces. Enterprise Architect has a wide range of tools that can be used to create a Technical Reference Model that acts as the foundation for all existing and new architectures. The most compelling of these tools is the Profile tool that can be used to extend the core language constructs and grammar of the Unified Modeling Language. Communication Infrastructure such as Servers can be defined that interface to Application Platforms, which in turn provide interfaces for Business and Infrastructure Applications. Once a profile is created it can be either imported into a repository or bundled together with a number of other facilities into a Model Driven Generation (MDG) Technology. The visualization and documentation for the TRM can be created and viewed in the model itself or generated out as documentation. This section lists the main tools available in Enterprise Architect that can be used to create and maintain a Technical Reference Model. There is also a wide range of additional tools that a modeler might find suitable when applying the technique in a particular context. The complete list of tools is available from the topics: Meet the Enterprise Architecture Tools and Additional Enterprise Architecture Tools. The Profile is part of the Unified Modeling Language extension mechanism allowing a modeler to make extensions to the grammar of the language by using Stereotypes and Tagged Values to create domain, industry or organizational level elements. This mechanism can be used to create a Technical Reference Model by creating the foundational elements,, services, interfaces and connectors as stereotypes within the profile. These elements can also have Tagged Values added to capture additional properties. Toolbox pages can be created and groups of elements and connectors can be added that users can apply to create new elements. Communication Infrastructure such as Servers and Network devices can be defined that interface to Application Platforms, which in turn provide interfaces for Business and Infrastructure Applications. 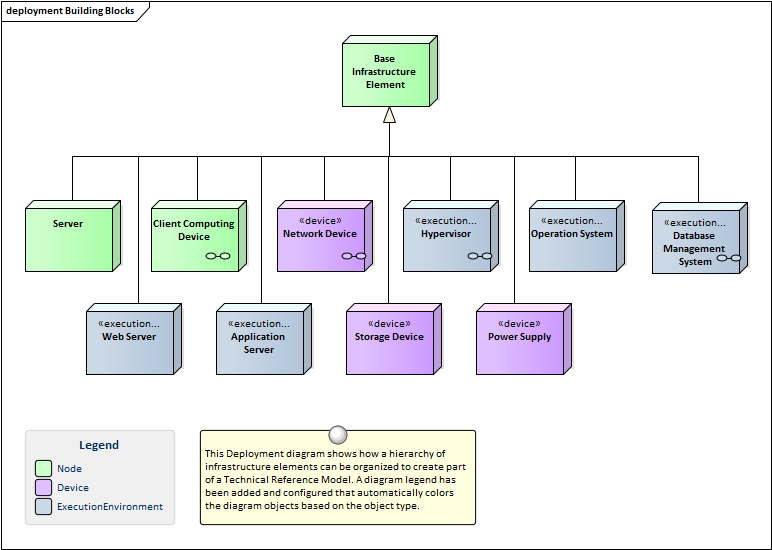 The Deployment diagram can be used to model all of these elements and can show the relationships between the different levels of elements in the Technical Reference Model, from the Communication Infrastructure and Application Platforms to the Application. Hardware Nodes and Network Devices need to interface to other Nodes and Devices through published Interfaces. These can be described with Unified Modeling Language (UML) Ports that can be used to describe aspects of the interface such as IP Addresses and Protocols. These describe the physical or virtual connections between the various pieces of hardware that make up the system. The Specification Manager is a powerful tool for working with lists or catalogs of elements including the elements that make up the Technical Reference Model and provides a Word Processor or Spreadsheet like interface for entering, maintaining and viewing elements. Servers, Network Devices, Operating Systems, Containers, Applications and Infrastructure and Application Services and Interfaces can all be created and viewed as a catalog and detailed descriptions and a range of properties can be added directly through the interface. Changing an elements details in the Specification Manager will change them in all other places in the repository such as Deployment and Component diagrams and windows. The Specification Manager can be used with group of elements and shields a user from needing to know about the underlying representation as they are simply working with a list as they would in their favorite Spreadsheet or Word Processor. Working sets are a useful facility for working with Technical Reference Models, as they allow a series of views to be collected as a set, given a name, saved and reopened at a later time. They are useful for working with different stakeholders who might be interested in a particular set of views. The set can include diagrams, Matrix Profiles, Team Reviews and more, and any number of working sets can be created. Enterprise Architect has a powerful and flexible documentation generator that can produce Docx and RTF Word Processor files, PDF and HTML reports. Any number of views of the repository content can be created by generating documentation and the powerful Virtual Documents facility allows content to be cherry picked from anywhere in the repository and grouped into sections presented with common template. The formatting in element or diagram notes can also be carried through to the documentation. A sophisticated template facility exists that provides a range of built-in templates and also allows the user to create their own templates, defining styles, cover pages, tables of contents, images and a wide range of other formatting options. Many of the elements that make up the Technical Reference Model, such as servers and devices, are commonly represented by images that help the viewer to visualize the type of device or server that is being represented. Many of the manufacturers and Cloud providers make a set of images available that can be used as alternative representations of these elements. Images from the standard Image Library could be used, vendor images imported or the organization is free to create their own graphics to represent concepts in the Technical Reference Model or that have particular meaning to individuals or groups of stakeholders. The Image Library is a global store of images in the repository that can be applied to any number of diagram elements. There are built in libraries but for the Technical Reference Model it is common for organizations to import libraries of images that can be used to represent particular vendors or providers products and services. The images can be in a variety of formats and when used to change the appearance of an element they create a compelling diagram that is often more appealing than the geometric shapes of the modeling languages. Where possible it is recommended to store a vector based image so that it can be effectively scaled in a diagram. The images can also be used when defining the metafile for a stereotype.